More than 2.5 million Canadian households will have multiple TV subscriptions, paying for TV through a traditional distributor and at least one other OTT (over-the-top) TV service, up over 150% from 2012 levels. By the end of 2014, the number of households that will pay for a second basket of TV content will be more than 100 times greater than the number of households that have cut the cord in 2013, and cancelled their subscription TV, according to Deloitte's 2014 Technology Media & Telecommunications (TMT) Predictions report. For more than a decade, Deloitte's TMT Predictions have provided advance insights into the implications of what's to come in technology, media and telecommunications. Deloitte's TMT Predictions are based on global research including in-depth interviews with clients, industry analysts, global industry leaders and more than 8,000 Deloitte member-firm TMT practitioners. "As more and more content owners, aggregators and platforms such as cable, telecom and satellite providers make their content available online through subscription, the number of Canadian households with multiple subscriptions will rise," said Duncan Stewart, Deloitte's Director of Research for TMT. "So far, at least, the cord-stackers are running far ahead of the cord-cutters. Households will want the best quality and an abundance of content which will have an impact on bandwidth and put upward pressure on monthly download allowances." Organizations that offer apps, content and services will have a greater opportunity to win a share of the consumer's wallet as Canadians double up, or even triple up, on TV subscriptions. With global combined sales of PCs, smartphones, tablets, TVs and computer gaming equipment plateauing in 2014, technology spending may shift from hardware to the software, content and services categories. Based on current data and projections, Deloitte predicts that market adoption for PCs, tablets, TVs, computer gaming equipment and smartphones may be saturated and global sales for the combined revenues of these top selling devices will level off, but the opportunity for smartphone adoption will be amongst seniors 65 years and older. Currently less than 30% of seniors own a smartphone in the developed world, and the number will rise 50% in 2014. 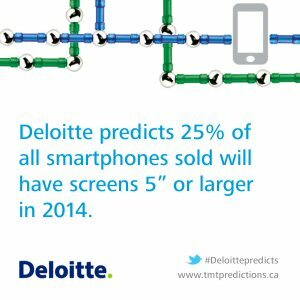 Deloitte also predicts the smartphone generation gap will continue closing and will possibly be non-existent by 2018. But some things may not change: 30% of those over 65 who own a smartphone have never downloaded an app. "The change in the physical form of the smartphone is key to why seniors will embrace the device more and more," said Richard Lee, a TMT Consulting Partner. "Smartphone screen sizes have increased from smaller than 3.5-inches to at least 4-inches. The larger screen size provides improved functionality and experience for everyone, especially seniors." The appeal of larger screens will also mean growth in the adoption of phablets. Devices boasting screen sizes between 5.0 and 6.9-inches diagonally will represent a quarter of smartphone sales worldwide, but Canadian sales will likely be lower: 15-20% of smartphones, or just over a million phablets out of a 6 million annual smartphone market. Deloitte also predicts that technology will reduce patient wait times and decrease the cost of health care by shifting the focus from prevention to early intervention. There will be 75 million eVisits in 2014 in North America, potentially saving over $3 billion compared to in-person doctor visits, and will benefit patients and doctors both for receiving basic diagnoses, and reducing wait times as well as providing better care for remote communities through services like tele-stroke. There is long-term potential for Massive Open Online Courses (MOOCs) to disrupt the education market as cash-strapped governments and students face costs associated with education, but not until key challenges are overcome. Enrollment in MOOCs in 2014 is expected to increase by 100%, but a surprising 93% or more of MOOC students fail to complete courses they registered for. "MOOCs are an increasingly attractive method of learning and a suitable education and training model." said Stewart. "There's a lot of discussion about their potential for university and college education, but the more exciting near term market is MOOCs for enterprise education and on-the-job training." Phablet are not a Phad - The lines will blur as phones and tablets converge. Phablets - part phone, part tablet - are smartphones with a screen size of 5.0-6.9 inches. They're not doomed because of their size: global sales will be 100% higher than in 2013, with 25% of 2014 smartphone sales, or 300 million units, worth $125 billion. Wearables: the eyes have it - Global sales for all categories of wearable computers in 2014 will exceed $3 billion. Some wearable devices will be better positioned for success than others, with smart glasses likely to sell 4 million units at a price point of about $500, for a $2 billion market. Doubling up on pay TV - By the end of 2014, as many as 50 million homes worldwide will pay for TV through a traditional distributor and have at least one other OTT (over-the-top) TV service. Narrowing the gap: seniors embrace the smartphone - In 2014, the fastest growing demographic for smartphone adoption globally will be individuals who are 65 and older, with 50% increases year-over-year, and resulting in more than 40% of seniors owning a smartphone. 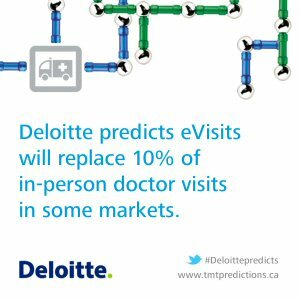 eVisits - In 2014, the global health market will be driven by eVisits, which are an alternative to face-to-face appointments that offer cost savings to public and private health systems, opportunities for improved patient experiences and access to care; as well as reduced wait times. 100 million eVisits in 2014, with 75 million in North America, saving as much as $3 billion. MOOCs (short term/long term) - Enrollment in Massive Open Online Courses (MOOCs) will be up 100% compared to 2012 to over 10 million courses, but they will not disrupt the tertiary education market in 2014, with fewer than 5% completing their courses. But the enterprise market looks like it will be an early adopter, both in Canada and globally. Death of the voice call - but only for some - The proliferation of smartphones, data plans and full-featured messaging apps is expected to create a category of voice seldoms. In 2014, the 20% of Canadian cellular customers who log the fewest minutes of voice calls will spend less than two minutes per day talking on their phones. Instead, many are letting their fingers do the talking through various text messaging applications. Those who like TV like it a lot -By the end of 2014, the 20% of English-speaking Canadians who watch the fewest minutes of traditional TV will watch just over 30 minutes per day, down from nearly 60 minutes in 2004. At the same time, the one fifth of English Canadians who watch the most traditional TV are predicted to watch even more: 8.2 hours per day, about the same as in 2004, but up 10% from 2009 levels. This decline amongst the first group and the increase amongst the group who watch the most TV will have virtually no effect on the average English Canadian TV viewing of 3.8 hours per day. Demographic commonalities are found in TV viewing behaviours by age, language and ethnicity and even by income and education, which means that advertisers will have the opportunity to better target the audience they want to reach. The Converged Living Room: a plateau approaches - Global combined sales of smartphones, tablets, PCs, TV sets and gaming consoles have enjoyed remarkable growth since 2003, almost 12% per year, but Deloitte predicts a plateau in growth is imminent. Sales will grow at a slowing rate with a ceiling of about $800 billion a year. TV sports rights: extra premium - The global value of premium sports video rights will increase by 14% in 2014, compared to growth of 5% from 2009-2013. This surge will be led by North American sports leagues, including the recent Canadian NHL announcement, and European soccer. 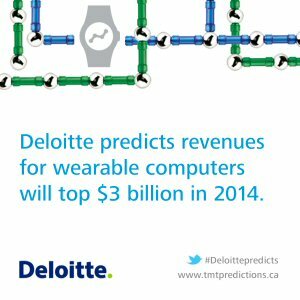 Deloitte's TMT predictions will be showcased in a 12-stop Canadian road show with events starting on January 14. Sign up to attend an event here. House calls are back - Just Log On. 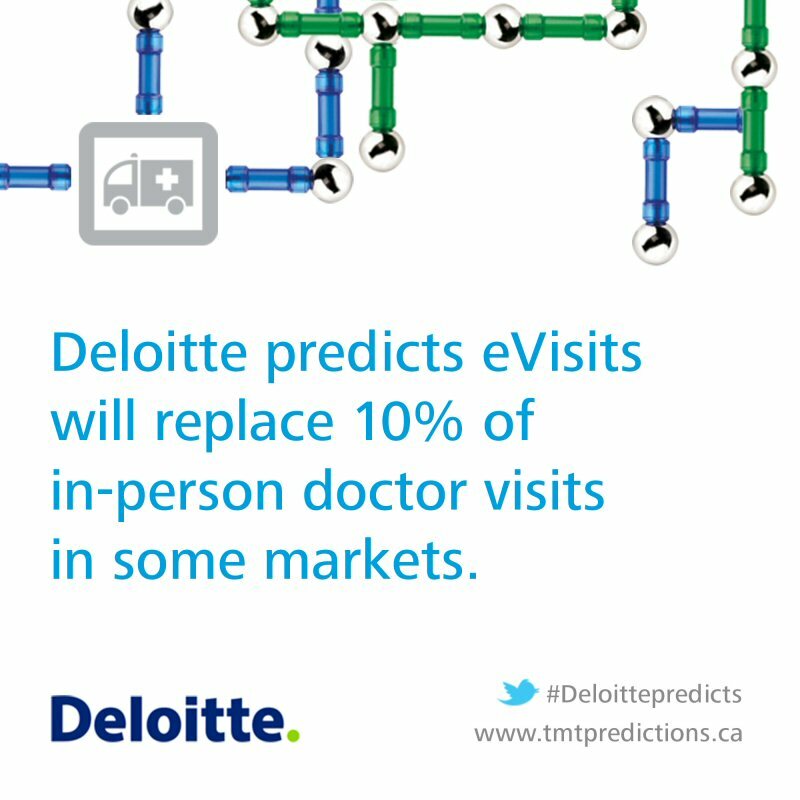 In 2014, "eVisits" will replace 10% of in-person doctor visits. Screen - with Envy. 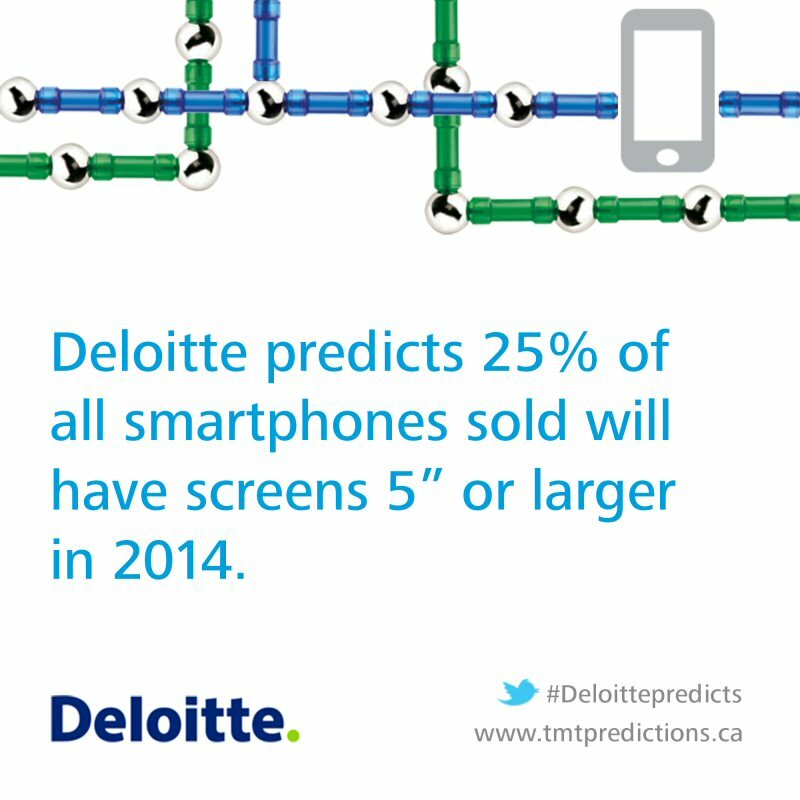 25% of smartphones sold in 2014 will have screens 5-inches or larger. They eyes have it. 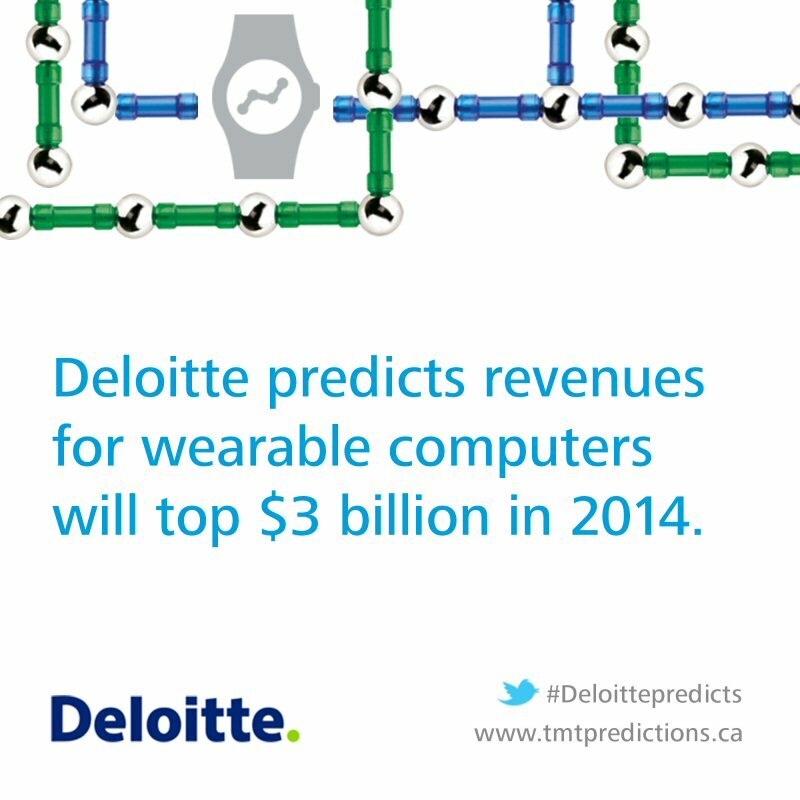 Deloitte predicts revenue for wearable computers will top $3 billion in 2014.